"This easy recipe for corn muffins hold a surprise filling. These are great for breakfast!" Preheat an oven to 400 degrees F (200 degrees C). Grease 12 muffin cups, or line with paper muffin liners. Combine cornmeal, flour, baking powder, and salt in a bowl. Beat the butter, honey, and sugar with an electric mixer in a large bowl until light and fluffy. The mixture should be noticeably lighter in color. Add the room-temperature eggs one at a time, allowing each egg to blend into the butter mixture before adding the next. Pour in the flour mixture alternately with the buttermilk, mixing until just incorporated. Fill each muffin cup about 1/3 full. Place a banana slice onto the batter in each cup and top with about 1/2 teaspoon of peanut butter, pressing down slightly to cover the banana. 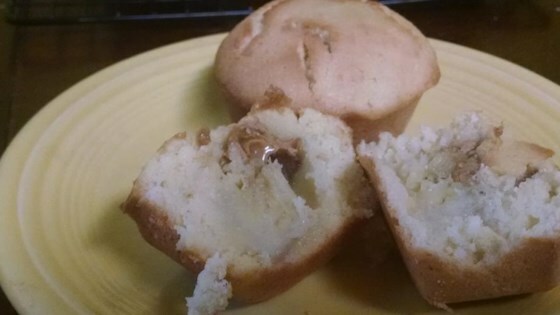 Continue to fill each muffin cup with batter, until the cup is 2/3 full. My husband and kids are in love! I did halve the sugar as suggested and they didn't even notice. I also made some with blackberry jam and some with cherry jam and they were just as amazing!! !